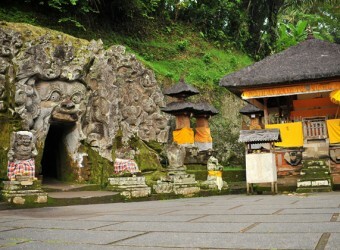 The remains locate near Ubud area in the center of Bali, Goa Gajah. Goa Gajah means “Elephant Cave” in Indonesian. It is very old remains and it is told that built in early 11 century. In the cave, Hinduism God, Ganesha that has elephant face and human body and the Linga of Hinduism 3 Gods, Shiva, Wisnu, and Brahma. There is the bathing place that has reliefs of 6 goddesses Wijadari. I also visited the bathing place but it was crowded with local people. It might be because of new　year? Many tourists visited this place. There were also Javanese people.